Nuclear genes determine the vast range of phenotypes that are responsible for the adaptive abilities of organisms in nature. Nevertheless, the evolutionary processes that generate the structures and functions of nuclear genes are only now be coming understood. The aim of our study is to isolate the alcohol dehydrogenase (Adh) genes in two distantly related legumes, and use these sequences to examine the molecular evolutionary history of this nuclear gene. We isolated the expressed Adh genes from two species of legumes, Sophora flavescens Ait. and Wisteria floribunda DC., by a RT-PCR based approach and found a new Adh locus in addition to homologues of the Adh genes found previously in legumes. To examine the evolution of these genes, we compared the species and gene trees and found gene duplication of the Adh loci in the legumes occurred as an ancient event. This is the first report revealing that some legume species have at least two Adh gene loci belonging to separate clades. Phylogenetic analyses suggest that these genes resulted from relatively ancient duplication events. The alcohol dehydrogenase (Adh) genes encode a glycolytic enzyme and have been characterized at the molecular level in a wide range of flowering plants [1–3] as well as in Pinus banksiana, a conifer species . The ADH enzyme is essential for anaerobic metabolism [5–7]. In both Arabidopsis thaliana and maize, oxygen stress and cold stress induces transcription from the Adh promoters; in addition, dehydration induces Adh transcription in A. thaliana [5–7]. Flowering plant species generally possess two or three isozymes , although A. thaliana has a single Adh locus . The Adh genes in Arabidopsis thaliana , Arabidopsis gemmifera  and Leavenwortia  in Brassicaceae, cottons , and grasses [12–15] have been subjected to molecular evolutionary studies. However, the broader evolutionary histories of the Adh genes in the angiosperms remain unclear since few studies have investigated the evolution of the Adh genes in a wide range of angiosperms. Recently, Small and Wendel  suggested that some Adh gene duplications may have predated the origin of each of the flowering plant families. However, the details of the gene duplications and deletions experienced by the Adh genes of most groups of the angiosperms remain unclear. Additional studies are needed to understand the evolutionary history of the Adh genes in various plant groups. In the legume family (Fabaceae), the Adh genes have only been investigated in crop species such as Glycine max and Pisum sativum. The purpose of these studies was to determine the ADH structures and functions rather than to explore the evolutionary processes of the Adh genes [e.g., [16, 17]], although these studies suggested that these legume species contained only a single Adh gene locus [16, 17]. Previous phylogenetic analyses of the Adh genes from various flowering plants have revealed that all of the Adh genes in legume plants characterised to date constitute a monophyletic group [1, 2]. In contrast, the Adh genes in Rosaceae, a family that is closely related to the Fabaceae [18, 19], appear in two separate lineages of the gene tree, suggesting that a gene duplication event had occurred before the Rosaceae evolved . Although these observations hint that the legume family may actually bear other Adh gene copies, this has not yet been investigated. Consequently, it remains unclear whether Adh gene duplication occurred during the evolution of the legume family. Here, we report the isolation of Adh genes from two quite disparate legume species. We found that both of these species contain another Adh gene locus in addition to the locus that was identified in legume species previously. We also investigated the molecular evolutionary history of the Adh genes in this family to gain further understanding of the evolutionary dynamics of nuclear gene families. Two Adh sequences were isolated from each of the two legume species examined in this study. The Adh genes isolated from Sophora flavescens Ait. were denoted SfADH1 and SfADH2 while the isolates from Wisteria floribunda DC. were denoted as WfADH1 and WfADH2. For these genes, 708 bp were sequenced. As shown in Fig. 1, this resulted in a predicted amino acid sequence consisting of 236 residues. The sequences determined in this study have been submitted to the DDBJ / EMBL / GenBank nucleotide sequence databases (Table 1). At the amino acid level, the homology among the Adh genes in the legume plants ranged from 70.7% to 91.8%. Alignment of the predicted amino acid sequences from selected Adh gene representatives. The lines indicate the groups that correspond to those in Figure 2. List of accession numbers used in this study. List of taxa and source of this study. 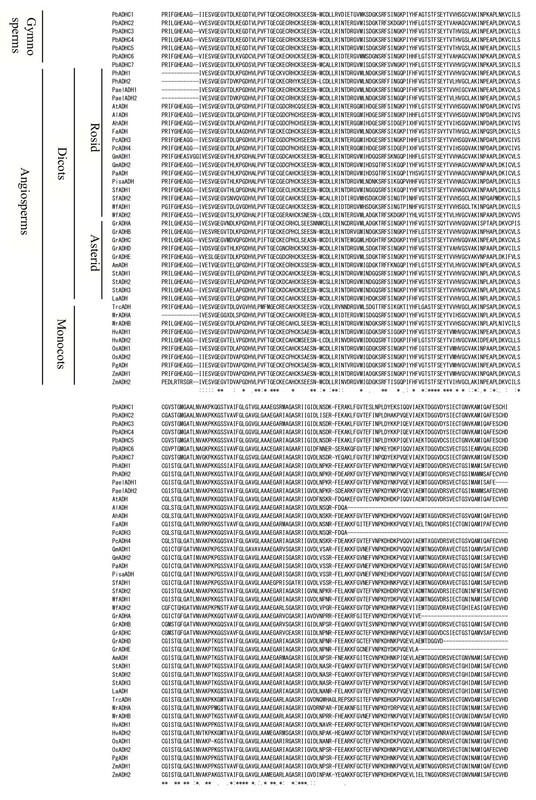 We conducted phylogenetic analyses of the Adh genes using seven sequences from Pinus banksiana (Pinaceae) as outgroups . To determine the phylogenetic position of the legume Adh genes isolated in this study, we subjected their sequences to ML analysis by employing a data set including the previously published Adh gene family sequences from various phylogenetic groups [e.g., [1, 2]]. Our resulting Adh gene tree roughly consisted of two monophyletic groups that we denoted "Clade I" and "Clade II" (Fig. 2). Clade I contains only Adh genes from dicots, while Clade II contains Adh genes from both dicots and monocots. The legume Adh genes isolated in this study appeared in two separate clusters, one in Clade I and the other in Clade II (Fig. 2). For convenience, we call these clusters " Legume-clade I" and " Legume-clade II". Legume-clade I contained the SfADH1 and WfADH1 sequences as well as previously published Adh genes sequences from the legumes Glycine max, Pisum sativum, Phaseolus actifolius and Trifolium repens (Fig. 2). Legume-clade II consisted of only the SfADH2 and WfADH2 sequences and was located far from the other legume Adh sequences (Fig. 2). None of the other legume Adh sequences that have been published previously fell into Legume-clade II. However, the Adh gene in Pyrus communis (Rosaceae), which belongs to the family that is closely related to the Fabaceae [e.g. [18, 19]], occurred at the sister position to Legume-clade II. The phylogenetic tree based on Adh gene sequences obtained by the maximum-likelihood method. The log-likelihood of the best ML tree is -3981.05. The numbers below the branches are the bootstrap values of 50% or more support. The Adh genes from legumes roughly fall into two monophyletic clades that we denoted as Clade I and Clade II. GeneTree analysis using the Adh gene sequences suggested that the legume Adh genes were duplicated before and after the angiosperms diversified (Fig. 3). 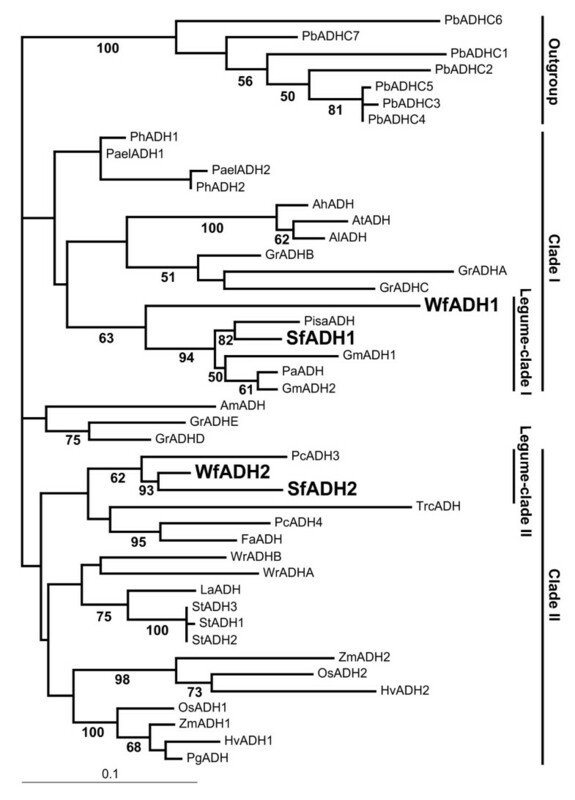 This indicates that the Adh genes in Clade II have undergone more duplication events than those in Clade I (Fig. 3). Part of the simplest reconciled tree that has the lowest number of duplication and deletion events. The reconciled tree involves 24 gene duplications and 44 gene losses for a total cost of 68, and requires 40 deep coalescenses. The solid boxes indicate gene duplications that were inferred on the basis of mismatches between the gene tree and the species tree. The open boxes indicate those duplications that required multiple copies of Adh genes within the same species. The gray lines indicate the lineages that are presumed to be lost after the duplications or were not found in our analysis. Although a previous study detected a monophyletic group of Adh genes in legumes , we found additional legume Adh genes that were related more distantly to the previously detected legume Adh genes. This is the first report showing that there are two Adh lineages in legume plants, each of which belongs to quite separate clades denoted as Legume-clade I and II, which themselves fall into distinct clades denoted as Clade I and II (Fig. 2). Notably, the Adh genes belonging to Legume-clade I are closely related to the Arabidopsis thaliana gene in Clade I (Fig. 2). Arabidopsis thaliana has a single Adh locus and transcription from its promoter increases under cold and oxygen stress [5–7]. Thus, the legume Adh genes in Legume-clade I may have similar functions to that of the A. thaliana gene. Our study also revealed that the legume Adh genes belonging to Legume-clade II form a sister group to the Adh gene isolated from Pyrus communis in Rosaceae (Fig. 2), which is a closely related family to the Fabaceae in the angiosperm phylogeny [20, 21]. The function of the Adh gene in maize is also similar to that of A. thaliana [5–7]. Thus, our phylogenetic result suggests that function is the plesiomorphic character of the Adh gene family (Fig. 2). On the other hand, Clade II consists of many genes of both monocots and dicots, suggesting that the functions of the Adh genes in this clade may be more diversified due to the accumulation of many mutations during the course of angiosperm diversification that alter the primary structure of the ADH proteins. However, our phylogenetic analyses failed to indicate whether the genes in the Legume-clade II are orthologues or paralogues of the Adh gene in maize (Fig. 2). Thus, the function of the Adh genes in Legume-clade II remains unclear. This study revealed the complicated evolution of the Adh gene family that occurred during the course of plant diversification. In our study, the phylogenic tree resulting from GeneTree analysis showed that some Adh genes in flowering plants evolved in complex manner that included several duplication events (Fig. 3). Duplication events in Adh genes have also been detected in other plant groups at various evolutionary levels. For example, Sang et al. showed that diploid species of Paeonia (Paeoniaceae) had two or three Adh sequences and that repeated duplication or deletion events occurred after the diversification of this genus. Small and Wendel  analyzed Adh genes in Gossypium (Malvaceae) in great detail and found that these Adh sequences (denoted as GrADHA, GrADHB, GrADHC, GrADHD, and GrADHE) had experienced duplication events both before and after the divergence in Gossypium. 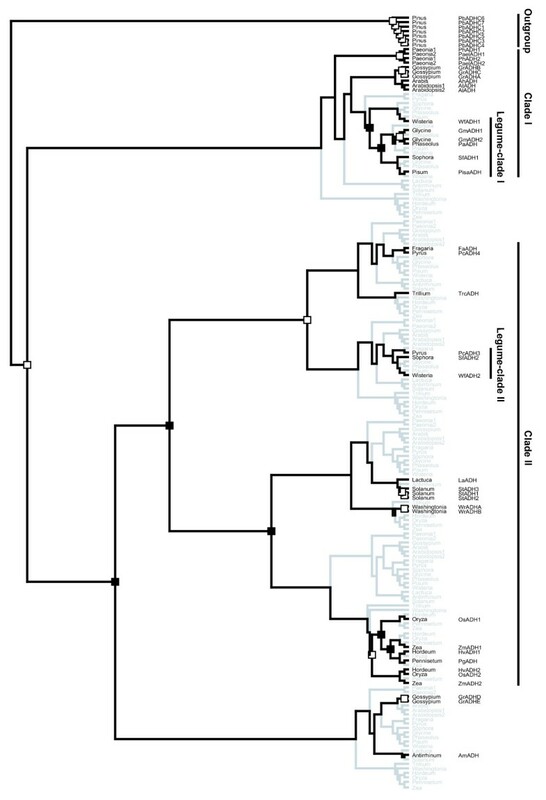 Consistent with this, our GeneTree analysis revealed that in legumes, duplication of Adh genes occurred before the legume diverged, since the two quite distinct legumes Wisteria floribunda and Sophora flavescens have paralogous genes in each of two clades (Fig. 3), although all previously known Adh genes in legume plants such as Glycine max, Pisum sativum and Phaseolus actifolius belong only to Legume-clade I. Why were additional Adh loci not found in other legumes? It is possible that the expression of the Legume-clade II Adh genes in Glycine max, Pisum sativum and Phaseolus actifolius Adh genes is limited to a specific developmental period or organ. Further analysis of Adh mRNA expression during various developmental phases and in different organs of these plants, such as roots, stems and fruits, may reveal the presence of an additional Adh gene in these species. Another possibility is that orthologues of the Legume-clade II Adh gene in the previously examined species have lost their function. Additional investigations throughout the legume family are needed to test this hypothesis. Duplicated genes arise frequently in eukaryotic genomes through local events that generate tandem duplications, large-scale events that duplicate chromosomal regions or entire chromosomes, or genome-wide events that result in complete genome duplication . Indeed, the existence of multigene families is evidence of the repeated gene duplication that has occurred over the history of life. One of the examples of the comprehensive analysis of gene duplication events in plants is the study of the MADS-box gene family. This gene family, which plays a central role in the morphogenesis of plant reproductive organs such as ovules and flowers, had experienced duplication events before the origin of angiosperms . Moreover, some specific functions were gained through duplication events that took place after the diversification of flowering plants . Thus, gene duplication has long been recognized as an important mechanism for the creation of new gene functions [25–27]. It is likely that each of the Adh genes in the legumes that were identified in the present study would have been subjected to different selective pressures over a long period. To determine whether this resulted in new functions, functional analyses of the legume Adh genes in each clade will have to be performed in the future. In this study, we chose Sophora flavescens Ait. and Wisteria floribunda DC. from the legume family (Fabaceae). They belong to different subfamilies or tribes in the traditional classification . They also fall into different phylogenetic groups in the phylogenetic tree constructed using legume rbcL sequences [29, 30]. We also used tissues from Antirrhinum majus L. (Scrophulariaceae) and Trillium camtschatcense Ker-Gawl. (Trilliaceae). Flowers and leaf tissues were collected from the experimental garden of Tohoku University and native individuals of these species in the field. Vouchers for all species used in this study are listed in Table 2 and have been deposited in the Herbarium, Graduate School of Science, Tohoku University (TUS). List of taxa from which Adh was isolated in this study and source of plant materials. List of taxa that Adh was isolated in this study and source of plant materials. Total mRNA was isolated according to the modified protocol of Hong et al. . Thus, 3 g of flowers and leaf tissues were homogenized for 2 min with 3 volumes of detergent buffer containing 10 mM Tris-HCl (pH8.8), 50 mM NaCl, 6% (w/v) p-aminosalicylic acid, 2% (w/v) triisopropylnaphtalensulfonic acid, and 6% (v/v) 1-butanol. The homogenates were extracted three times with an equal volume of phenol/chloroform/isoamyl alcohol (25:24:1, v/v/v) with vigorous shaking. The final aqueous phase was collected and the total RNA was precipitated with ethanol and 3 M sodium acetate on ice for 1 hr. The total RNA was then treated with Oligotex-dT30 (TAKARA, Japan) to purify the poly(A) RNA. Single-stranded cDNA was synthesized by priming with the random 9-mer or the oligo-dT adaptor primer (TAKARA). The cDNA was amplified by PCR in a 50 μL reaction volume containing approximately 50-ng total DNA, 10-mmol/L Tris-HCl buffer (pH 8.3) with 50-mmol/L KCl and 1.5-mmol/L MgCl2, 0.2-mmol/L of each dNTP, 1.25 units Taq DNA polymerase (TAKARA) and 0.5-μmol/L of each primer. The primers used have been published previously and are denoted as ADH-F1, ADH-R1 and ADH-R2 . A degenerate primer was also used (LADH-1F1: 5'-ATATTTGGTCAYGAAGCTGG-3'). This primer was designed on the basis of the conserved region of Adh, which was determined by comparing the published sequences of Adh . We carried out PCR with the following thermocycle protocol: (94°C, 2 min) × 1 cycle; (94°C; 30 sec, 50°C; 30 sec, 72°C; 120 sec) × 45 cycles; (72°C; 15 min) × 1 cycle. After the amplification, the reaction mixtures were subjected to electrophoresis in 1.5% low-melting-temperature agarose gels and the amplified products were purified. The purified PCR products were then cloned using the TA cloning kit (Invitrogen). Plasmids containing the cloned fragments were isolated by the alkali method and digested with EcoRI. Plasmids containing fragments less than 1.5 kb in size were selected and sequenced using the Thermo Sequence II dye terminator cycle sequencing premix kit (Amersham Pharmasia Biotech) or the BigDye Terminator cycle sequencing premix kit (Applied Biosystems) with the Model 373A or 310 automated sequencer (Applied Biosystems) according to the manufacturer's instructions. The sequences of the Adh genes used in this study were obtained from the GenBank/EMBL/DDBJ database (Table 1). The predicted amino acid sequences were aligned using CLUSTAL X  based on the GONNET protein weight matrix. The phylogenetic relationships between the genes were analyzed using the maximum-likelihood (ML) method. For the ML analyses, we used the PROTML program of PHYLIP version 3.6 . We employed the JTT model of amino acid substitution. All indels were counted as missing. We performed ten random sequence addition searches using the J option and global branch swapping using the G option to isolate the ML tree with the best log-likelihood. In addition, we performed bootstrap analysis with 100 replications. To infer the evolutionary events affecting the Adh genes, an analysis using GeneTree ver. 1.3  was conducted, as described by Fukuda et al. . The fully-resolved species tree used in the analysis was constructed on the basis of the previously published rbcL sequences in chloroplast DNA; the tree is considered to indicate the evolutionary relationships of the plants from which the Adh genes studied in this study were isolated . The ML tree with the highest log-likelihood was used for the gene tree. Both gene duplications and losses were considered to reconcile the gene tree with the species tree. Gene lineages that do not coalesce on each branch of the species tree were counted as deep coalescence . We thank Mr. K. Sato, Mr. H. Tokairin and Dr. M. Ohara for helping to provide and culture the plants. We are also grateful to Messers. H. Yamaji, N. Sasamoto, K. Yoshida, Y. Uyama, S. Matsumura, S. Horie, T. Yamashiro, K. Saito, M. Kitame, A. Shiro, P.-Y. Yun, Y. Mashiko, H. Ashizawa, M. Nakada, R. Shinohara, M. Komatsu, S.-Y. Kim and M. Hirai for help and advice. This work was supported, in part, by a Grant-in-Aid for Scientific Research from the Ministry of Education, Culture, Sports, Science and Technology, Japan and in part by the Sasakawa Scientific Research Grant from The Japan Science Society. TF carried out the molecular genetic studies, IS and TN participated in the sequence alignment, and IT and TO drafted the manuscript. JY participated in the design of the study and performed the phylogenetic analysis. AK, TK and MM conceived of the study, participated in its design and coordination, and helped to draft the manuscript. All authors read and approved the final manuscript.